Either having an abundant space or a small space in their backyard, people resort to ideas that can efficiently spice up their home. But sometimes, the answer to spicing up your adobe is just in adding a pool to your landscape design. Toronto Pool presents to you some exotic pool landscaping designs that can make your backyard parties lit! 1 ) A permanent solution for relaxation! Stop using the lousy chairs and floats to settle your body. The main purpose of installing a pool is to achieve the utmost relaxation. So, try to take the full advantage of this opportunity by installing permanent chairs in the pool. This will help you soak up the splash and help flirt up with the sun. We would recommend you to install the pool chairs as close to the water as possible. It will help you to enjoy the best of both worlds. 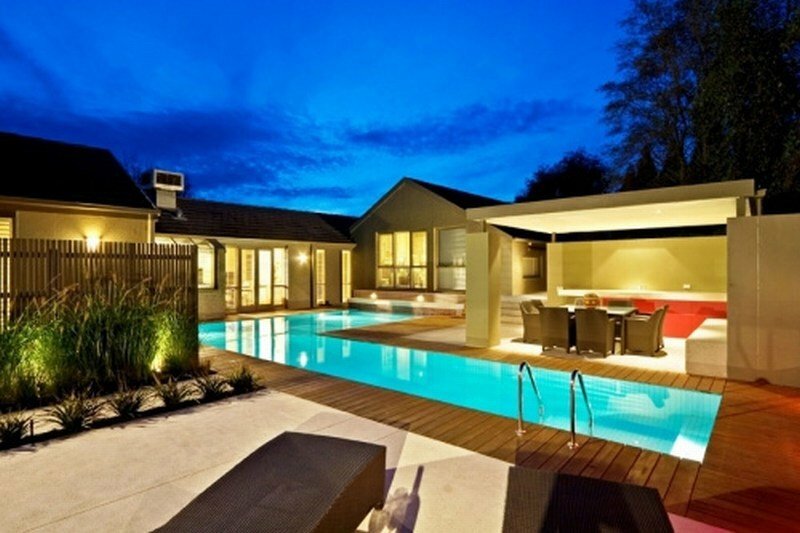 Let your backyard swimming pool reflect the artist in you with designs that speak art. We have a dramatic piece for your backyard that can be a party stunner. 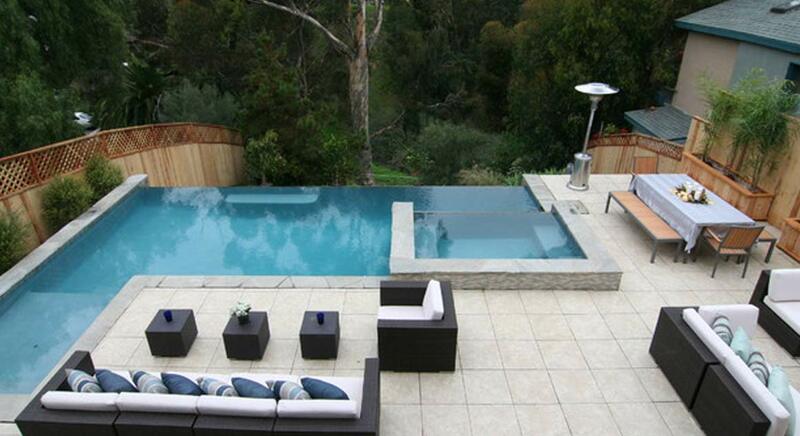 Made with dark stones, this pool landscape speaks for itself and you. Want to have a cohesive spa experience? 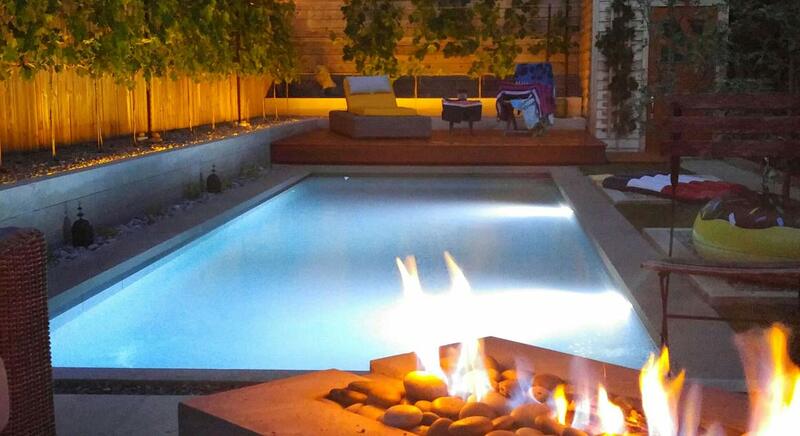 Try our spa influence backyard pool design that serves the same purpose as a spa, without going to the spa. Blended well with white stones and green landscape, this is the serene epitome of relaxation. Time to get your fluffy robes! 4 ) That’s So Cal! Want to have a feeling as if you are living in a Southern California mansion? 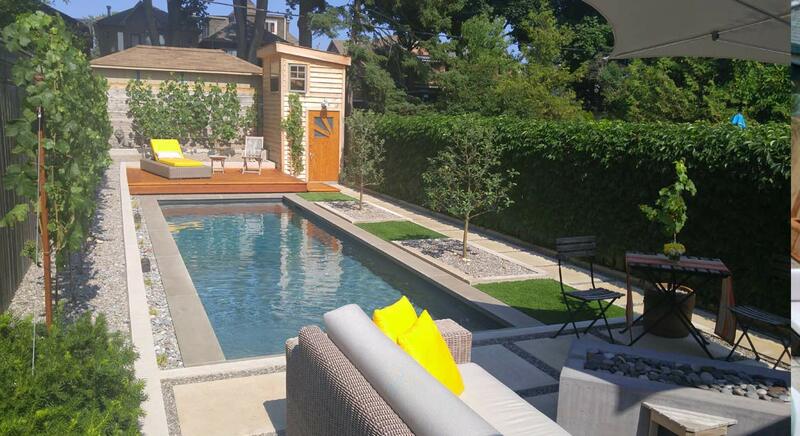 This Southern California inspired pool will take you there. 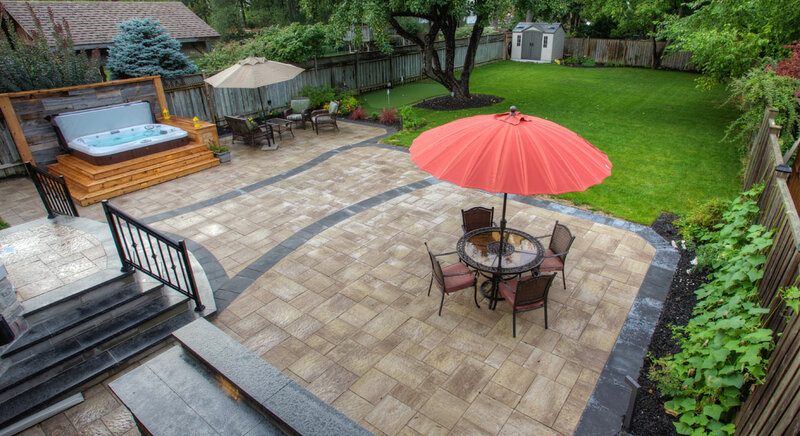 With a solid patio maintaining the cottage culture, adds a touch of class with comfort. We have got something for all! This pool landscaping design is ideal for families who have members in different age group and interests. Not only will the pool accommodate the people who want splash but will also leave room for those who are willing to stay away and engage in some other activity. Many, like Land-con’s this client, installed an outdoor kitchen for the best summer cookout and pool party. Find your European getaway right in your backyard with a pool that reflects the best of European style. This pool guarded by strong stoned walls speaks volumes. Add shrubs to complete the experience. Enjoy Eastern royalty in your background with this pool guarded with strong angles. Bring a character and life to your plant by adding poolside chairs and lounge and bring in the eastern flavor in your backyard. Luxury does not mean clustering of many different elements. Luxury can be in simplicity. The cleanest and sleekest styles make up to being Luxurious. Keep you aesthetic basic and clean and your backyard will simply define luxury. Can you ask for more? Imagine a pool landscape, so extravagant, making it look almost like paradise. This Tuscan beaut will surely make many compliment your choice of style and view your house in a different light. Do not want your pool to take over all of your backyard space? 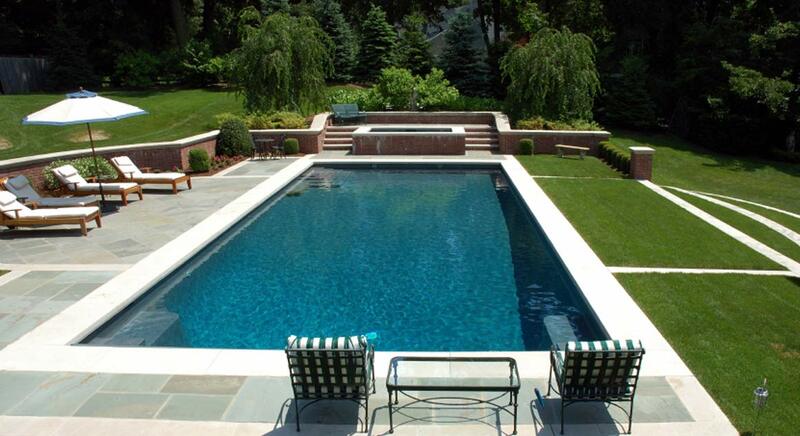 Design it efficiently for the pool to co-exist with your other requirements and elements. If you have such similar requirement, add a hot tub space which allows more of everything. Liked our designs and want something similar for your backyard? 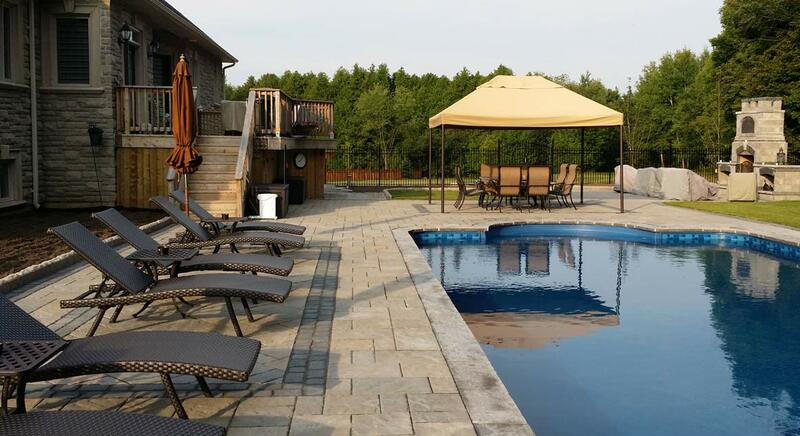 Contact Toronto Pool now and get yourself a pool of great Pool Landscaping ideas. Call now for an expert consultation.